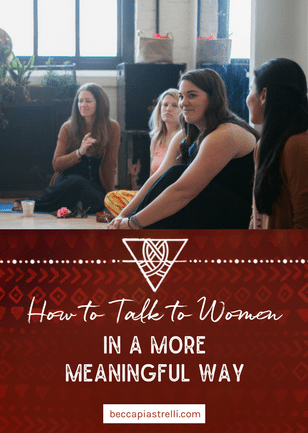 Over the years, women have come to me wanting to know how they can cultivate more meaningful relationships with other women. They tell me they’re tired of the same old surface level conversation, the automatic default to complaining about their partners or their job, gossiping about other women, or the dreaded social awkwardness that can come with new or different social situations with other women. Yes, there is a certain comfort in talking about the weather or what happened on The Bachelor last night, but deep down…they/she/you/I am craving a deeper, more meaningful connection with the woman on the nearby mat in yoga class, or at school pickup, or in the cubicle down the way. To get to know who someone is on the inside - to hear her story and know her heart - and be able to share all of yourself too is something that has me taking a deep breath just thinking about it. What freedom! Meaningful connection is something so many of us deeply crave in our lives, but can feel so scary to dive into. What if we’re judged? What if we’re mocked? What if we’re straight up rejected? “It can be so hard to talk about living meaningfully with others without sounding like a crazy person,” said one woman to me recently. I felt her words in my belly as soon as I heard them, because I know them well. Growing up, I was often called weird by girlfriends when I would bring up unconventional topics or talk about complicated emotions. Looking back on those moments, I can see how the little girl me felt rejection and other-ness by being called that word. For whatever reason, those women were uncomfortable with what I had to say. And, because I deeply desired to feel accepted by them, I allowed that word to affect me so much that I put a lid on my curiosities and desires for many years. Years later, I found out that the word weird has ancient roots including the Anglo Saxon word wyrd and Old Norse word Urðr - all meaning fate or destiny. So really, when those girls were calling me weird, they were truth tellers about who I truly was at my core. It is so important that we make meaningful connections with women, even if it means we risk being “weird”. Because there was a time when women communed together in a way we don’t anymore. They lived in spaces of trust and support - helping to birth each other’s babies, make nourishing meals, tend to sickness with age old remedies, bleed during their moons, and provide additional support wherever it was needed. These feminine spaces were safe, so the women could wail and moan and rage and fall apart with each other knowing they were held and supported. Please don’t mourn the loss of this level of trust and compassion in female relationships today. Instead, I invite you to join me in bringing it back - in helping all of us remember the ways of sisterhood. A huge part of cultivating a safe space to be vulnerable and connect in a deeper way is by purely listening - without an agenda, without a solution. This is also called witnessing. It’s just like it sounds – when you are a witness to someone, you aren’t intervening in their own process. This was tough for me to understand at first. It felt like it was going against my compassionate, helpful nature to sit and watch someone else suffer. If I was worried, I would intervene. I would proudly be the first girl to offer a box of tissues to the sobbing girlfriend. But by sitting quietly and observing someone else’s struggle, you are creating space around them to allow them to work through their own process. You get to open your heart and watch them open up more and more until they can see what needs to be healed in order to transform. To be fully present to another woman’s experience is the greatest gift you can give her. Feeling ready to start some meaningful conversations with your girlfriends? Here are some conversation starters inspired by and sourced from Alexandra Franzen to help you get started. Pick a few and then feel your way through with the women you’re with. You got this. Would you consider yourself an introvert, extrovert, or ambivert? How’s your relationship with the women in your life? Do you have any go-to questions you like to ask at girls night or on coffee dates that help you go deeper? As always, your words connect with me on the right topic at the right time. Your wisdom and innerbeauty are refreshing and I so appreciate your work here. Love that synchronicity, Margot love!